The Vatican has warned Catholic bishops around the world to monitor carefully a secretive traditionalist sect which prays to angels to combat demons. Opus Angelorum, which means "the work of angels" in Latin, was founded by an Austrian housewife who died in 1978. She claimed to have identified the angels and demons who were battling for the control of human beings. The Church said some members of the sect were carrying out "activities that disturb the ecclesiastical community". The BBC's David Willey in Rome says Opus Angelorum first attracted the attention of the Vatican 30 years ago, after the death of its founder, a woman from the Austrian Tyrol called Gabriele Bitterlich. Bitterlich claimed to have been in contact with an archangel and to have written down the names of hundreds of angels and demons, our correspondent says. The sect - which operates mainly in German-speaking Europe, Brazil and India - claims that women who have had abortions are possessed by the devil. The activities of Bitterlich's followers, including dozens of Catholic priests and nuns, eventually attracted the attention of the Vatican which ordered an investigation, our correspondent adds. 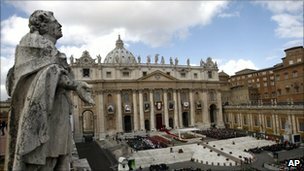 According to a letter sent by the head of the Vatican's Congregation for the Doctrine of the Faith, in 1992 members of Opus Angelorum agreed to follow the doctrine of the Church in return for official recognition. "In particular, [its] members were not to make use of the 'names' of angels derived from the alleged private revelations attributed to Mrs Gabriele Bitterlich and they were not to teach, spread or make use of the theories originating from these alleged revelations," Cardinal William Levada said. "Furthermore, they were reminded of the duty to follow strictly all liturgical laws, in particular those relating to the Holy Eucharist." However, several members of the sect, including some priests, "have not accepted the norms given by the Congregation for the Doctrine of the Faith and seek to restore what, according to them, would be the 'authentic Opus Angelorum'", the letter warned. "The Congregation has learned that very discreet propaganda in favour of this wayward movement, which is outside of any ecclesiastical control, is taking place, aimed at presenting it as if it were in full communion with the Catholic Church." Our correspondent says Opus Angelorum has no known connection with the best-selling novel, Angels and Demons, written by Dan Browne, who has been criticised by the Vatican for his fictional works involving superstition in the Catholic Church.